Learn all about the upcoming watchOS 4, including its release date, top features, and biggest changes. What Apple Watches will it run on? Can I test future watchOS 4 betas? Editors’ note: We’ve updated this story to include an expanded watchOS 4 FAQ. The Apple Watch might still feel like a new product, but its already on the fourth version of watchOS. And each one has brought some pretty major changes. Version 2 brought nightstand mode and third-party complications, and version 3 introduced the dock, a new Breathe app, and better overall navigation. However, watchOS 4, unveiled at the Worldwide Developers Conference keynote in San Jose, is more of a maintenance release than a full new version. Still, it brings some cool new ways to interact with our favorite apps and add a little fun to the screen we see the most. Here’s everything we know so far about watchOS 4, including a few new features that we can’t wait to try. Apple Watch is a new enough product so no models are excluded from the new version. Whether you own one of the originals, or a Series 1 or a Series 2 watch, you’ll be able to install watchOS 4 when it arrives. If you pre-ordered a Series 3, watchOS 4 will come installed on your new watch. Apple will release watchOS on September 19, the same day iOS 11 is available for download. Unlike iOS and OS X, Apple hasn’t previously offered a public beta program for watchOS. It’s possible that changes this year, but we have no reason to think it will. So to try it out before the masses you’ll need to sign up for a developer program membership for $99 a year. However, if you do decide to go that route, keep in mind that Apple doesn’t allow you to downgrade to an earlier watchOS version without taking it into an Apple Store for repair. At this stage, however, it’s best to just wait it out. A little. The Dock that holds your apps your apps now scrolls vertically rather than horizontally, making better use of the Digital Crown. You can also choose to ditch the honeycomb home screen with a new list view that will simply display a vertical list of your installed apps. The biggest change to watchOS 4 is the addition of a few new faces, most notably a Siri face. Built for people who crave a steady stream of information on their wrists, the Siri face will automatically display the most relevant info based on the time, your location, and your routine. For example, if you usually drive to work at 8 am, it will display the traffic, or if you use Homekit to shut your lights at night, that button will appear at bedtime. Additionally, you can rotate the crown to cycle through the various cards. Whenever you raise your wrist, the face will dynamically update with the latest bit of relevant info, and if you need to know something that isn’t displayed, you can also tap the new Siri complication to ask a question. watchOS includes several new faces, including Siri, kaleidoscope, and Buzz Lightyear. Where the Siri face offers always-changing information designed to keep you organized and motivated, the kaleidoscope face offers always-changing pattern designed to keep you happy. Just like those long tubes that you held up to the light and rotated to change shape, the new kaleidoscope face uses your photos to create a circular pattern that constantly moves and changes throughout the day. And if you spin the Digital Crown while looking at it, it’ll turn even faster. Are there really Toy Story faces? Yup. 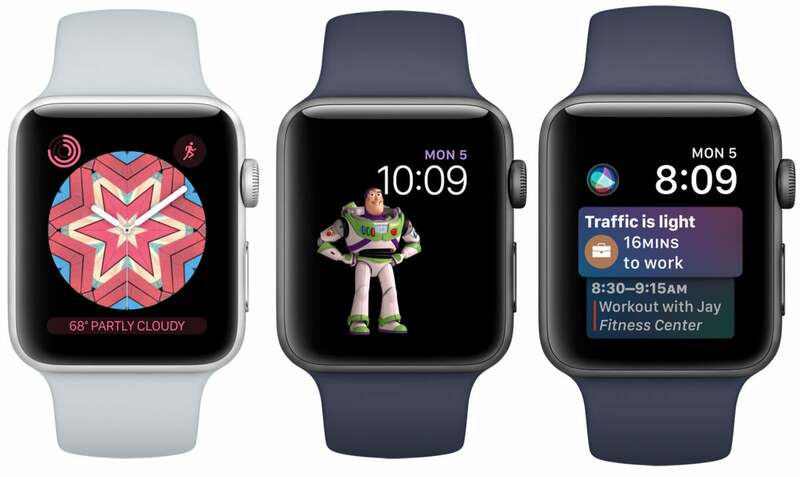 Woody, Jesse, and Buzz join Mickey and Minnie as Apple Watch faces, but there’s a twist. Instead of using their hands to show the hour and minute, the faces feature a simple digital clock and date and let the characters frolic around it. And each time you raise your wrist to check the time, you’ll get a random little animated vignette. Enough about faces. Tell me about fitness. Apple has tweaked the Activity app to make us a little more likely to use it. Achievement progress alerts will let you know if you’re close to accomplishing a goal or tell you what you can do to match yesterday’s numbers. And there will also be personalized monthly challenges that inspire you to push a little harder. And in case you need a little more motivation, there’s also a cooler animation when you close all three rings and even bigger celebrations for hitting monthly milestones. Yes! Apple has made the Workout app easier to use with a new interface that puts a quick start button front and center. Also upgraded is the app’s swimming capabilities, adding distance and pace trackers as well as auto sets, so if you’re swimming laps it will recognize when you rest at the edge of the pool. There’s also a new option for High Intensity Interval Training and the ability to swipe to add a new workout to the same session. And you’ll also be able to set a playlist to start automatically when your workout begins. 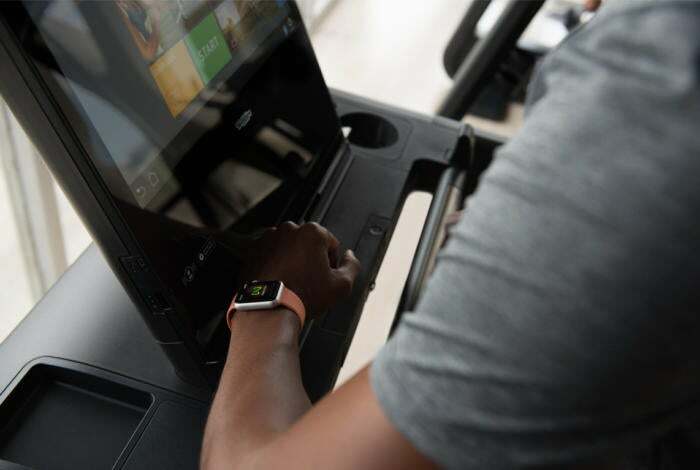 Your Apple Watch will be able to communicate with gym equipment via NFC in watchOS 4. What if I work out at a gym? WatchOS 4 has you covered there too! If you use gym equipment like a stairmaster or treadmill to burn your calories, you can now tap into all of data inside it using a new two-way data exchange feature will keep your metrics in sync. 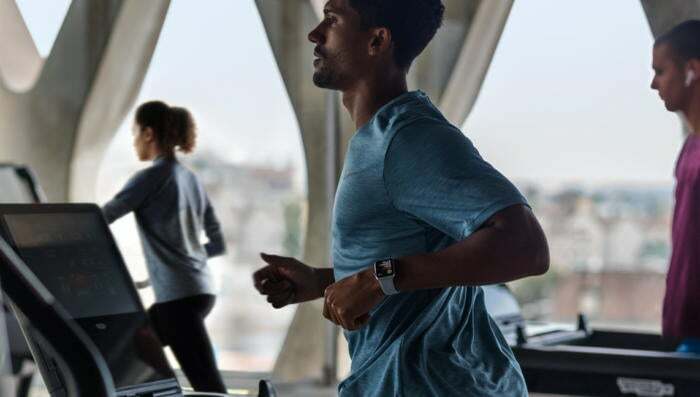 Apple has partnered with top brands like LifeFitness, Cybex, Matrix, TechnoGym, Schwinn, Star Trac, and StairMaster to equip their machines with NFC readers that will seamlessly sync to your watch. I heard there are changes to the heart-rate sensor. What are they? Apple Watch will now display your resting and recovery heart rates, which could help target any potential heart problems. Your watch will also notify you of any irregularities— like if you are resting and your heart rate spikes for no reason. And Apple is working with Stanford to monitor for arrhythmia. Of course there are. The Music app will now automatically sync music based on your specific tastes, and navigation is now album-art based, letting you use the crown to scroll through your songs like on a tiny digital jukebox. If you’re a playlist junkie, you can now send more than one to your watch. And if you have an Apple Watch Series 3 with cellular, you’ll be able to stream all 40 million songs right on your wrist. For now, all we know is that there will be a new Apple News app for the watch, which will display headlines on the Siri face and let you save articles for later reading on your phone. What’s this about a flashlight? Apple is adding a new flashlight icon to the Control Center that will let you see in the dark or use it as a blinking safety light when cycling. Apple hasn’t shown us exactly how it will work, but presumably it will put a bright white screen on the watch for illumination. Any improvements to Apple Pay? With watchOS 4, you can send payments to your friends right on your watch. You’ll be able to send money to anyone in your contacts using Apple Pay, and they’ll receive the money in their new Apple Pay Cash account (once this feature is live in iOS 11). Then, they’ll be able to transfer it to their bank account or keep the funds around for future Apple Pay purchases. Of course, Apple is rolling out many more capabilities for developers that will make their watch apps better than ever, including screen autorotate, background navigation and audio recording, and faster responsiveness. Additionally, Apple Watch is now supporting native core Bluetooth, which will allow it to interact with small devices around you for continuous health and fitness monitoring.